On Sunday, 13 January, CW3E kicked off the 2019 fieldwork season as two teams headed to Northern California to sample an impactful Atmospheric River (AR). One team launched radiosondes from the UC Davis Bodega Marine Laboratory in Bodega Bay, CA (coastal site) while the other performed stream surveys and collected stable water isotope samples in and around Potter Valley in Mendocino County (inland site). 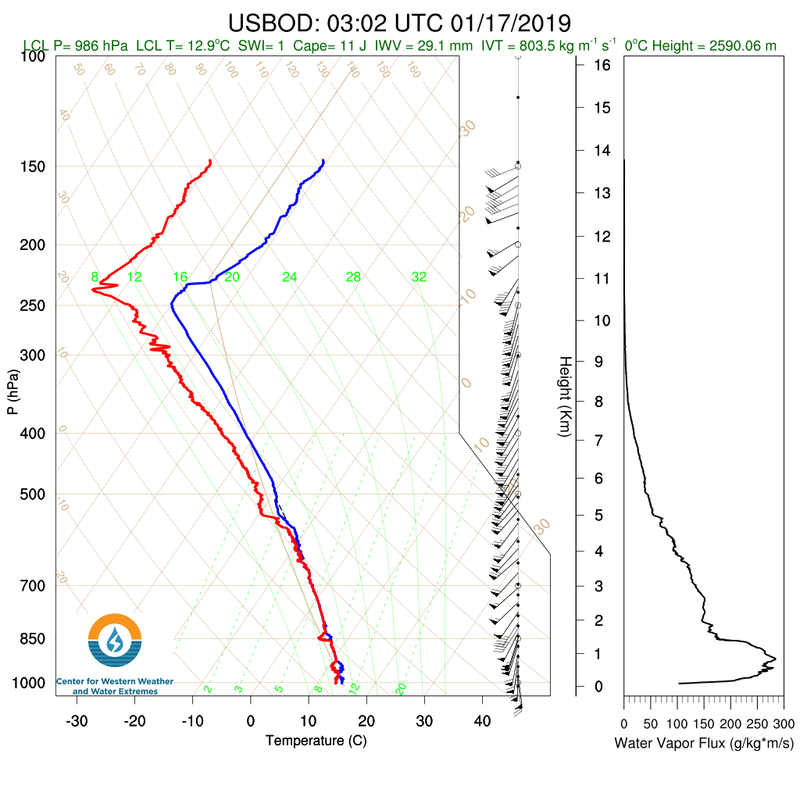 The trip was marked by the strongest AR event so far for winter 2018-2019, with a peak integrated water vapor transport (IVT) of over 800 kg m-1 s-1 and integrated water vapor (IWV) of over 29 mm at Bodega Bay (0302Z 17 January 2019). The highest precipitation accumulations occurred at the Windy Gap location, which recorded over 4” of precipitation between 16 January and 17 January. The CW3E plans to continue release radiosondes, take manual streamflow measurements, and collect isotope samples during AR events throughout this winter season. The radiosonde data are shared with the National Weather Service Weather Forecast Offices in Eureka, Monterey, Reno, and Sacramento. This campaign supports current efforts in understanding ARs and their impact on water resources and flood control operations in the Russian River Watershed, as a part of the Forecast-Informed Reservoir Operation (FIRO) project. A radiosonde launch completed at Bodega Bay (0302Z 17 January 2019) showing the peak IVT recorded during this AR: 803.5 kg m-1 s-1. Douglas Alden (Engineering Mentor), Edwin Sumargo (Postdoc), and Laura Thapa (Lab Assistant) set up radiosondes (left) and released them (right) from Bodega Marine Laboratory. Carly Ellis (Field Research Associate), Chad Hecht (Staff Research Associate), and Tippy Canoe (AR Mascot) collected stream samples at Mewhinney Creek in Potter Valley, CA.